The Public Building Commission of Chicago (PBC) has established policies for conducting business in a legal, ethical, and transparent manner and it encourages its employees, contractors, consultants and any interested members of the public to assist in preventing or stopping behavior that does not support these policies. 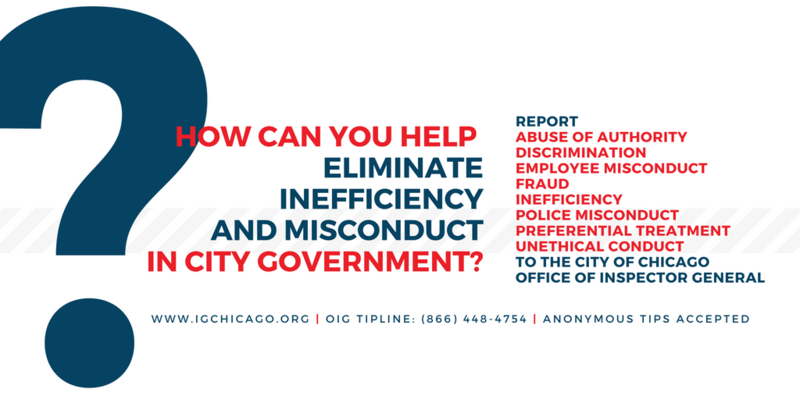 If you see corruption, fraud, waste, or dishonest practices of any kind, report it to the City of Chicago Office of Inspector General (OIG). Concerned employees, contractors, consultants, and members of the public may contact OIG via its hotline or at igchicago.org. The OIG’s hotline and website are completely independent from the City of Chicago and PBC.